While the old expression “Beauty is only skin deep” may imply a lack of concern for one’s physical appearance, there is no denying the extensive expense in cosmetics to achieve a healthy, youthful glow, particularly when it comes to facial flaws. Since our skin, like an individual body, responds quite differently, what is useful or pleasurable for one person’s skin may cause an allergic reaction or harm to another’s. Take the case of soap, for instance. Debate still rages as to the advisability of using soap on one’s skin, but some type of cleansing agent applied to the skin is necessary to remove waste eliminated through its pores and sebaceous glands. Not surprisingly many individuals approached Cayce with questions regarding their outer appearance, one of which concerned the topic of soap. Which Soaps Are Best to Use? 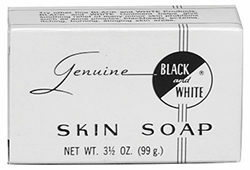 According to one Web site, the Genuine Black and White products have not altered its manufacturing process since its inception in the 1930s, even down to the same design and logo on the packaging. Occasionally the readings specified that the proper Black and White cosmetic was Genuine of Chicago, and not Plough’s of St. Louis. However, the latter company claims that it has always been the sole manufacturer, once having had a warehouse in Chicago, and is the maker of the products today. Besides the characteristics listed earlier, the Black and White products are nonirritating to the skin, can be used “as the base for a better skin condition” (Cayce), have a less astringent quality, and are less acidic than other cosmetics on the market. Conditions for use include: to soften facial scars and brown spots on nose; prevent blemishes; eliminate large pores, pimples, and blackheads; and for a face massage, sagging muscles, and rough skin. Castile had the next highest number of recommendations (twenty-three individuals), several of them being for hair treatment or shampoo—to cleanse the hair, to serve as a hair tonic, to treat falling hair and dandruff, and to prevent baldness. A majority, however, were advised to use the soap, sometimes in conjunction with the shampoo. 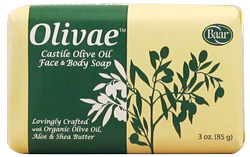 An olive oil-based soap, it was first manufactured in Castile, Spain, hence its name. As a soap, “Pure Castile…is the better as a cleanser” (Cayce), considered the least harmful and most helpful in correcting and beautifying the skin, our body’s largest organ. One fifteen-year-old young lady with blackheads and large pores was advised to place a warm, wet Turkish towel on her face and neck for eight to ten minutes, then thoroughly rub in pure Castile soap, followed by one to two minutes of cold cloths (about three or four applications). She was then to pat her skin with her hands “until the circulation in neck and face is thoroughly established again.” (Cayce) Another woman, no age given, was told to use Castile soap as part of her treatment for skin abrasions. 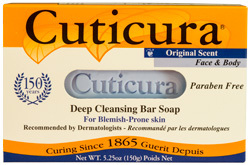 Cuticura products—soap, salve, or ointment—also received high marks for thirty-six individuals, nine of whom were told to use the soap: for skin abrasions, eczema, large pores, or as an antiseptic. It has a long history, dating back to 1865, was among the first soaps sold commercially in North America (according to its Web site), and is still sold today for blemish-prone skin. Other brands noted in the readings include Camay (1), Sweetheart (1), Woodbury (1), Palmolive (2), Pond’s (3), Elcaya (5), and Ivory (5) [“Ivory is the better, or the purest” (Cayce)]. Lawrence M. Steinhart, a Revlon executive and international beauty authority, writes in Edgar Cayce’s Secrets of Beauty Through Health [Berkley Medallion Books, New York, N.Y., 1974 (out of print)]: “Certain types of soap dissolve the dirt on some skin better than others, while dryer skins require a cream now and then… If cleansing is not carried out properly and consistently, the waste matter hardens and remains in the skin, [becoming] more and more difficult to remove…” (p. 18) The use of any particular soap, however, remains an individual matter. “The use of pure soaps is preferable to any attempt to deodorize. Any that allays perspiration certainly clogs the activity of the respiratory and perspiratory system. And the activity of the glands closest, of course, under the arms and between the thighs or limbs, is that which causes such conditions. Then, the more often there is the use of the bath or the soap and water, the better it is. “(Q) What ingredients in such preparations are harmful?